You'll use this page to view and/or manage your team's groups. A group is a collection of members and/or connections. You can share projects or folders with groups, which makes sharing simpler and more convenient. You can also email an entire group, which streamlines communication. There are several pre-populated default groups, marked by a badge, that will help you get started. Membership in these default groups cannot be modified and they cannot be deleted. If you are using multiple instances of Workplace Server, you can easily distribute projects to all those servers at once by adding them to a group. For more information, please refer to About Workplace Server. To filter by group name or email address, use the dropdown menu in the upper left corner of the list. You may select All Groups, Top Groups, Not Empty Groups, or Empty Groups (if Active Directory is enabled, you will see additional options). The list will automatically update. To filter by group name, begin typing your query in the Filter field. The list will automatically update. To remove a query filter, click the icon in the Filter field or next to the filter name. Use the check boxes on the left side of the group list to select more than one group. Begin typing the name of the member you want to add and select it from the dropdown, or click the icon to select the member from your team. (Only available to administrators and super administrators) Select this option to edit the group. This will open the Edit GroupA group is a collection of members and/or connections. Groups can be share recipients, thus making sharing simpler and more convenient. popup. Edit the fields as necessary, then click Update. Email Select this option to send an email to the entire group. An empty message, with recipients already populated, will open in your default email application. administrator or super administrator) Select this option to delete the group. This will open the Delete Group popup. Please note that all members in the deleted group will lose access to all projects shared with this group. 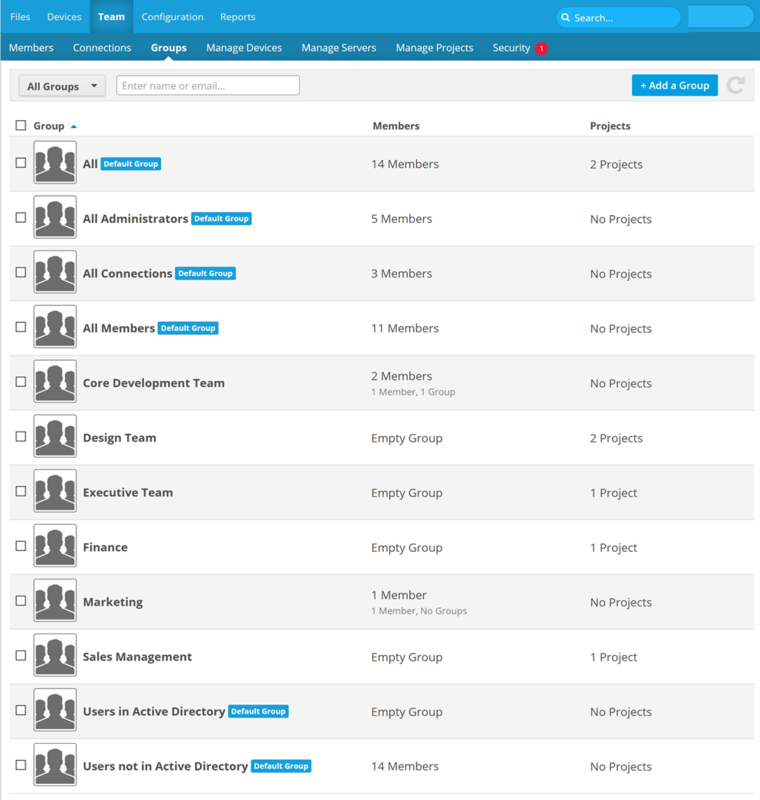 Neither the members in, nor the projects shared with this group will be deleted. Only the group will be deleted. If you are still certain you want to delete the group, click Delete. Only available to administrators and super administrators. Name* Enter the name of your new group. Email If you have a group email (email alias) for this group, enter it here. It will be used for emailing the entire group instead of individual email addresses. Description Enter an optional description of the group.